Miffy loves her mother very much, so every year when Mother’s Day comes around, Miffy searches around for a special, thoughtful gift that will show Mother Bun just how much she cherishes her. An ideal present if your mum loves crafty home accessories, these handmade crochet Miffy/Melanie dolls are designed in Holland and ooze style as well as being super cute! There are various dolls available – each with its own, interchangeable crocheted outfit. You can buy your mum a ‘Miffy Handmade crochet and her red dress’ HERE or a ‘Nina Handmade Nina Handmade crochet and her yellow dress’ HERE, for £18 each. Featuring Miffy’s signature white ears, this super cute porcelain mug has a fun bonus Miffy Face printed underneath to raise a smile for all. Your mum will love it! Buy your mum her very own Miffy face mug for £10 available HERE. Share the joy of life with your mum this Mother’s Day with this adorable pink Miffy slogan t-shirt. Available in a range of sizes and made from 85% organic cotton and 15% polyester, this delightful t-shirt is a great fit for a Mother’s Day gift. Pick up a Miffy Joie de Vivre short-sleeve shirt for £31.99 (usually £39.99) HERE. This beautiful 100% cotton long-handled tote bag featuring a bright Miffy walking with ducks design will brighten up her shopping trips – the perfect look for spring. Other designs available. You can buy your mum a Miffy Walking with Ducks Tote Shopper Bag for £8 HERE. For mums who love a splash of colour in the home, this white framed poster of Miffy Holding a Balloon is perfect. Featuring the adorable Miffy, the combination of the minimalist designs and bright colour makes this a must-have stylish piece of art. Other designs available. 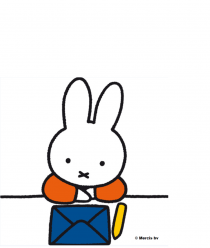 Give your mum her very own Miffy print for £19 HERE.